Xbox One owners itching to use their favorite headsets won't have to wait much longer. 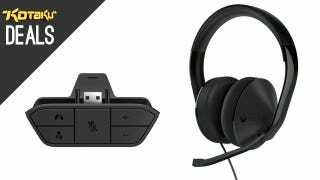 You can now pre-order the Xbox One Stereo Headset Adapter from Amazon for $25, or if you don't have a headset you like yet, give Microsoft's new stereo version a try for $80. As always, these preorders come with a pre-order price guarantee, and you won't be charged until they ship. Both accessories should ship on February 25; plenty of time to standby for Titanfall.